How to Get 3 Stars on Style Me Girl Level 12, "Punk Rock," Without Using Cash Items! | I Style Me Girl! How to Get 3 Stars on Style Me Girl Level 12, "Punk Rock," Without Using Cash Items! Level 12 of Style Me Girl is themed "Punk Rock," and features the model Joyce again. Starting with the mohawk, I gave Joyce a punk rock style worthy three stars, and as usual, I did it without using any cash items. 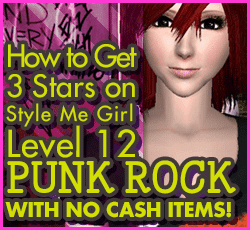 I am happy to share with you how to get three stars on Style Me Girl Level 12, "Punk Rock," with no cash items! The items I used to earn 3 stars on Style Me Girl Level 12, "Punk Rock," are pictured and described in the list below. The "Closet Items," screen capture image at right can be clicked to enlarge if you'd like a more detailed view. I got 3 tars thank you!